This morning the hoar frost laden trees and clear blue skies provided us with some beautiful panoramic scenery. I was hoping to get one or two male Pine Grosbeaks sitting in one of the trees near our feeders but no such luck. The contrast among the red, blue and white of the birds, sky and hoar frost respectively would have made a spectacular photo. 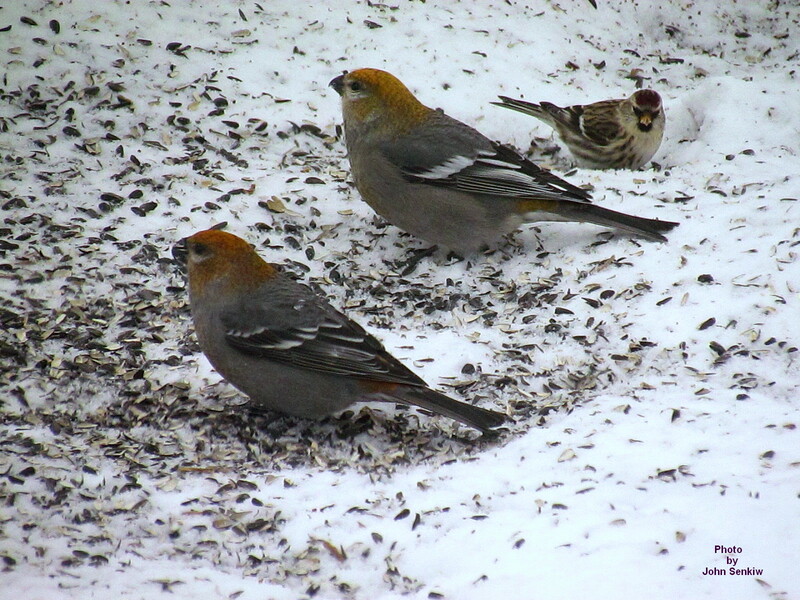 Anyway, our feeders were very busy despite the absence of the Pine Grosbeaks. 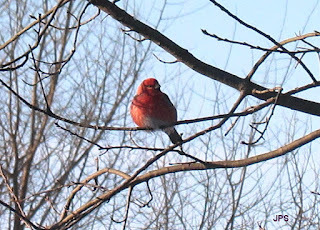 There were: three Red Breasted Nuthatches, four woodpeckers - a pair of Downys and a pair of Hairys, two male House Finches, several Chickadees, a half dozen or so House Sparrows and about two dozen Redpolls. Even a Raven was lazily floating overhead. The Pine Grosbeaks which have been regulars at our feeders the last several weeks never did show up. 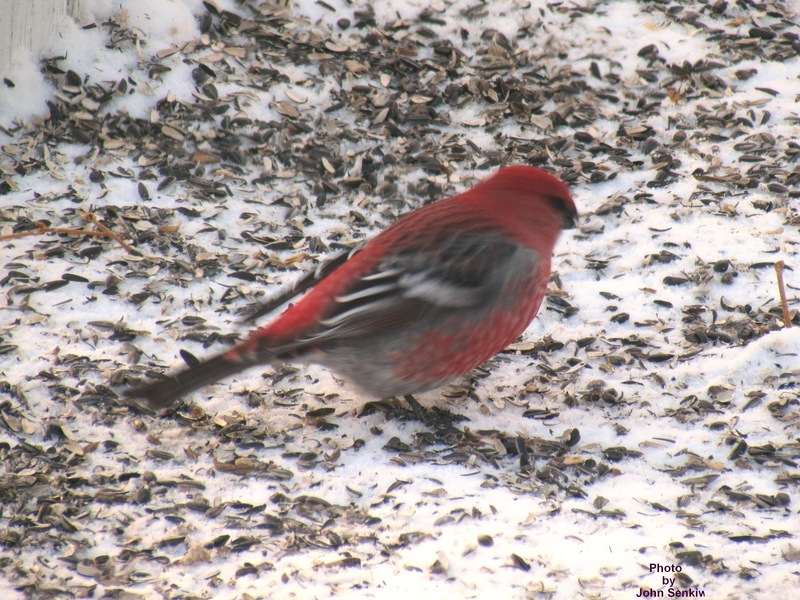 The robin-sized Pine Grosbeak is one of our most colourful and widespread winter birds. It is circumpolar in range breeding throughout the Boreal forests in both Eurasia and North America moving farther south in the winter. The female is essentially a grey bird with some greenish brown on its head and tail. The male is a striking pinkish red with black wings and tail. Both sexes have two prominent white wing bars. For a relatively large bird it has very soft and gentle vocalizations that seem to match perfectly with soft falling snow. 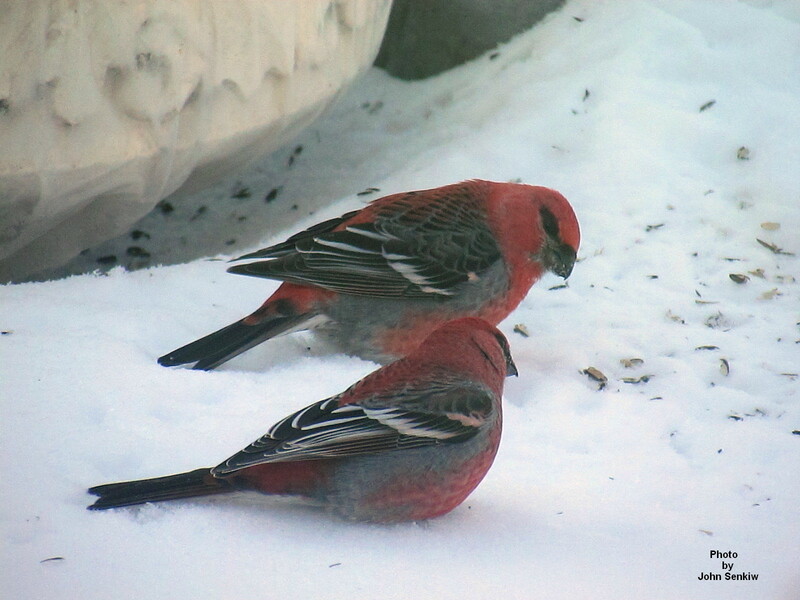 The Pine Grosbeak's vocalizations do not resemble that of any other bird and can be used confidently to identify it. 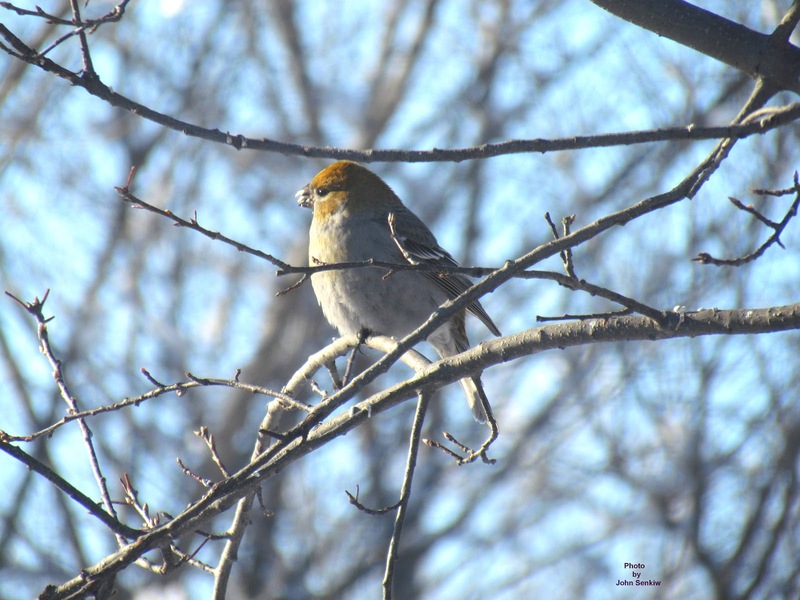 For the more accomplished birders it bears mentioning that the Pine Grosbeak is not really a grosbeak but our largest finch with a big bill from which it erroneously gets its name. As a field mark a finch's flight is undulating while that of a grosbeak is in a straight line. 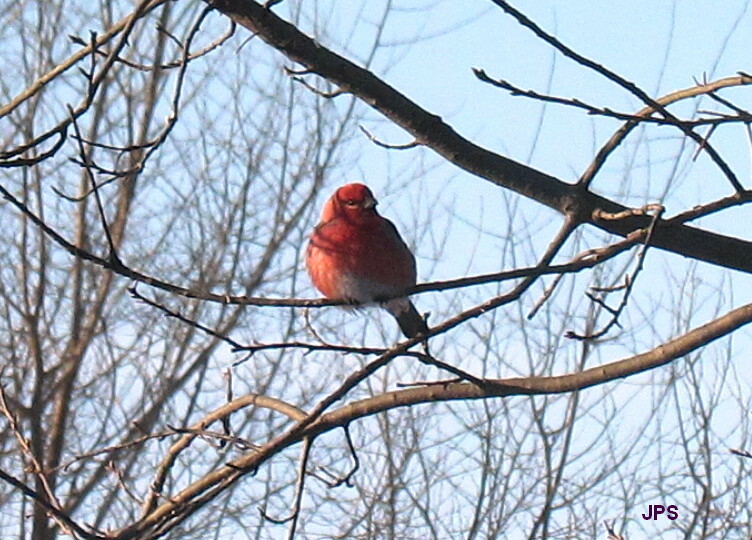 Although the Pine Grosbeak does not resemble any other bird it is surprisingly often confused with our Robin. When I was growing up on the farm every year some neighbour would report seeing a small flock of Robins in late February or early March. I am almost certain that the bird in question was the grosbeak and not a Robin. To non birders a Robin-sized bird with some red on it could easily be taken for a Robin. Quite recently I have had people tell me that they used to see "Winter Robins" although such a bird does not exist. Once again I am quite certain that the bird being referred to is actually the Pine Grosbeak. But then again, I have never seen Robins in winter nor have I ever been with anybody when they saw Robins in the winter so I cannot confirm my suspicions. Now that Christmas season is upon us I will not be submitting anymore birding articles until the middle of January or so. So, for the final pictures of this year a red bird with a white snowy background seems appropriate. 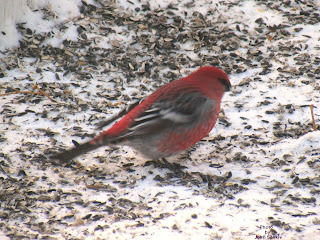 Down east the Cardinal is the preferred bird but since we do not have Cardinals here a Pine Grosbeak will do just fine. This week's pictures were taken several weeks ago in our backyard. The two male and female Pine Grosbeaks were feeding on Black Oil seed that had been spilled from a hanging feeder to the ground below while another lone male and female were in a tree checking things out below.